DBJ (more specifically: Rib Jacquard with birds-eye backing, see David J. Spencer, Knitting Technology: A Comprehensive Handbook and Practical Guide, 3rd ed., 2001, pp. 107ff.) is known in Brother manuals as Multi-Colour Rib. See page 38 of the KR850 ribber manual (the penguins) and page 11 of the manual for the KRC-900 color changer. Note that DBJ in 3 or more colors has some differences, though the basic instructions are the same. For your first practice sample, use this Triangles image that also comes with AYAB 0.9 (or newer), find it in the folder [Path to your AYAB installation]/AYAB/patterns/. The useful thing about this Triangles pattern is that row 1 selects 1 black needle per triangle, row 2 selects groups of 2, row 3 groups of 3 etc. If you watch the needle selection carefully you'll start to understand what it's doing. Set up the color changer (KHR900 manual, pages 2-4) with the black yarn (foreground color); the white slot (background color) is open ready to accept the yarn after the cast on. You might need the fine knit bar. Try it if your stitches sometimes tuck instead of knitting off. Make sure you have an even number of stitches on the ribber. Cast on in white in FNR (Full Needle Rib) as shown on pages 26-28 of the KR850 manual. Knit one or two rows of FNR. Carriage on left, outside the left turn mark. Main bed: Both part buttons in; KC1 or KC2. I usually use KC2 rather than KC1. Ribber: Both sliders (cam levers) up. Both lili buttons to lili. Lower slide lever to lili (center). Stitch Size depends on your yarn. Try 4/4. Set AYAB to 2-color, start at row 1, Infinite Repeat, start/stop needles 30/30, Ribber ("Ribber: Classic" for AYAB v0.95), Center. Bring the carriage out past the turn mark and stop to wait for the triple-beep as usual, just on this first row. Also check that the black yarn is in the feeder, and if this is its first row, check that the yarn end is hanging straight down and isn't caught anywhere. Knit across, wait for the beep. Knit back and into the color changer, the beep happens as you do so. Press the button to change to white. That's it, repeat: Knit across, knit back, change color. After the first set AYAB will have counted up two rows and be starting row 3, the row counter will show 4 passes. feel along the knitting on both sides from underneath, you may be able to tell if a loop is caught around a gate peg. hang the "sevens" wires and weights if the edge stitches are having trouble knitting off. 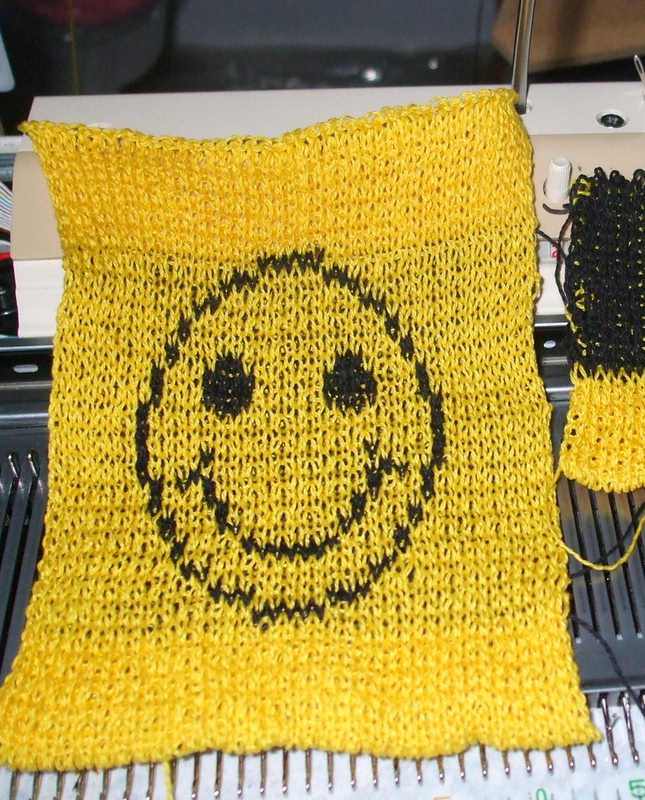 Then check again after several inches have been knit, by now you may be able to put a mirror underneath and check that the pattern you want is appearing on the work on the side away from you, and birds-eye stripes on the side facing you. For finalizing the knit, you may want to add 1-2 rows of FNR (KR850 manual, p. 28). Binding off (casting off) is described on page 53 of the KR850 manual. An alternative method ("Das Abketten II") is translated as follows: Transfer all stitches to the rear needle bed [to the needle bed of the KH 910 (KR850 manual, p.52)] and immediately set the empty needles of the KR 850 ribber back to the B-position. At the K carriage of the KH 910, set the tension dial 4 steps higher [to 7]. The tension dial of the KR 850 ribber carriage remains unchanged. Move the carriage from left to right. On the needles of the KR 850 ribber, stitches have formed around the previously empty needles. Disconnect the carriages [(KR850 manual, p. 15)] and move the KR 850 ribber carriage from right to left. Thereby, the stitches are removed from the needles of the KR 850 ribber. Now, lower the KR 850 ribber [to the lowest position (KR850 manual, p. 14)]. Set the needles of the KH 910 needle bed to the E-position. Remove the weights and the comb, then proceed by binding off as described on page 22 or pages 111-114 of the KH910 manual. In our Triangles sample with Infinite Repeat on, let's stop and observe, with the carriage on the left at the beginning of row 1 of its cycle of ten rows. We have just changed to the black yarn ready for the next row 1 as displayed in AYAB. Remember that AYAB's row numbering focuses on what's being selected not what's being knitted. Notice that what's selected now is the last set of 10 black needles to complete the previous triangle. It has completed knitting the previous triangle, and has selected sets of 1 needle to do the first point of the next triangle. Knit across right-left and change color to white. Stop again and observe before you knit the row. It has just knitted the single black stitches, and selected sets of 9 to be the white stitches that go in between the single black ones for that same row. Pass 1: Black yarn, knit whatever it was given by the last selection of the previous set. Select for the black stitches for row 1 of this set of two rows. Pass 2: Black yarn, Knit the first black stitches, select for the white stitches that will go in between the black stitches we just knitted, also for row 1 of this set. Pass 3: White yarn, knit the selected needles to complete row 1, select for the white stitches of row 2 of this set. Pass 4: White yarn, knit the selected needles, select for the black stitches of row 2 of this set. Notice that the selection is an "ABBA" sequence. Black, white, white, black; repeat. Each set of four passes does the selections for two rows of the pattern. But the set is not completely self-contained, its first pass completes the knitting of the previous set, and its fourth pass does a selection which will be knitted in the first pass of the next set of four passes. You'll see discussions about Brother 2-color DBJ needing to start by selecting from the right, so how does that square with AYAB always starting from the left? I think it's just an alternative way of thinking about how 2-color DBJ works. In the AYAB context where everything starts from the left, each set of 4 passes has provided the selection for the next set during its last right-left pass. So in a sense the first selection of the set did start on the right; in AYAB that is counted as the last pass of the previous set. Color changers are not 100% reliable, though there are adjustments you can make. Occasionally it will grab both yarns or neither, and disaster ensues. Use the slower rhythm enforced by AYAB to take a look at the yarn in the feeder every time as it come out of the color changer. You may be able to stop in time to fix it. AYAB 0.95 and earlier expect the black yarn first. The more usual convention is to do the white first, more intuitive. That will likely be changed in a future release of AYAB; for now the instructions describe black first. Otherwise 2-color DBJ works well as it is, doesn't particularly need any code changes. You might be wondering what happens on the very first pass. There's nothing pre-selected on the main bed, so it only knits on the ribber (alternating needles because of the lili settings) while selecting for the first black pattern stitches. Technically I think that means that there's an extra ribber row at the beginning, but it gets absorbed into the backing pattern and is not noticeable. In subsequent first passes of the cycle of 4 passes/2 rows, it has been provided with selected needles to knit in black. How do you end your pattern on exactly the right row at the end of a repeat? In Infinite Repeat you'll need to do one or two passes of the next cycle, but cancelling any selection on the second pass. In non-repeating, the long beep sounds after it has selected for the last row. Knit one or two more passes. When using the lili settings, you must have an even number of stitches on the ribber. Take a look at the sides of your sample, do you want to have the edge stitch always on the main bed? (Optional, but may look better) To keep an even number on the ribber, your main bed will need on odd number of stitches. Doing some FNR after the cast-on and before starting the pattern can make a wavy edge. With careful management, it's possible to use the last circular row of your cast-on as the first (setup) row of your pattern. Sometimes you want DBJ all in one color. Just make an image that's all white or all black, no color-changing needed. This article is copied from ravelry and modified by DerAndere. Thanks, Adrienne!